MyPhone releases the Rio 2 and the Rio 2 Lite today in their most awaited event this month. The local brand is banking on these devices after it took shot to fame since the smartphone series' inception last year. Thereafter, MyPhone has spawned several other devices bearing the lucrative moniker; and today is the big day for the next generation of Rio devices. 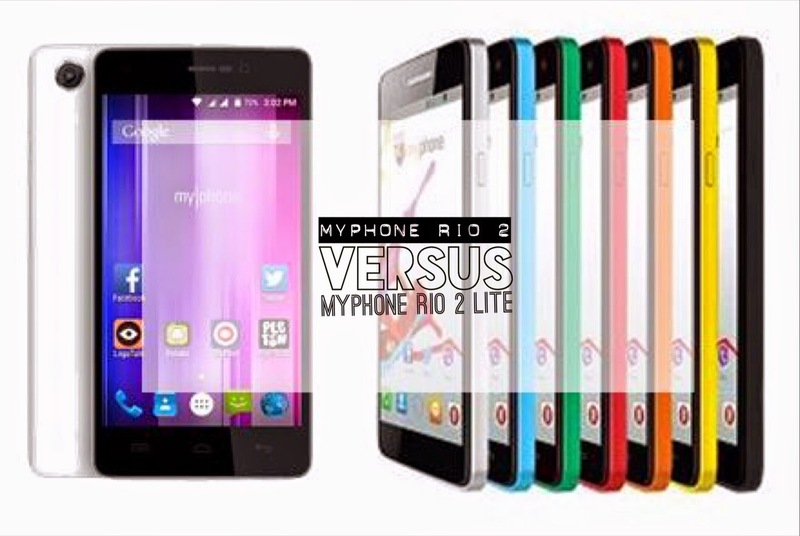 You'll see more of the handsets in this "MyPhone Rio 2 vs MyPhone Rio 2 Lite" post right after the fold. Both the MyPhone Rio 2 and the Rio 2 Lite churn with a 1.3-gigahertz quad-core CPU but the company has not given exact information about chipset as of this writing. Moreover, these handsets will have their respective 1GB of RAM and 8GB of internal memory. For active downloaders, the Rio 2 and the Rio 2 Lite supports microSD card expansion of up to 64GB. Both devices might be carrying the MediaTek MT6582 chipset which also features ARM Mali 400 MP2. The the two workers differ when it comes to their display. For one, the Rio 2 boasts a bigger 5-inch real estate with 1280 x 720 pixels. The Rio 2 Lite, on the other hand, carries a WVGA IPS panel in 4.7-inch diameter. In the camera department, these handsets feature 8-megapixel rear shooter. It is also worth noting that the Rio 2 houses a Sony-made module while the Lite settles with a Samsung sensor. Both have Blue Glass camera tech and LED flash. Flipping the devices, Rio 2 features a 5-megapixel sensor and Rio 2 Lite packs a 2-megapixel shutter. When it comes to the battery, the Rio 2 will have bigger capacity with its 2800 mAh rating than the 2120 mAh of the smaller device. The bigger rating is just right for the larger screen and HD display panel. On the software front, both will be powered by Android 5.0 Lollipop. Likewise, each of them will have a complete set of radios and 3G (HSPA+) connectivity. Plus, MyPhone also tapped Globe to give 100MB free data usage per month for one year. The MyPhone Rio 2 is priced higher at Php 5499 while the Rio 2 Lite's asking price is Php 4599. If you have Php 900 more to spare, the MyPhone Rio 2 would be a legit device for your hard-earned money. The Rio 2 Lite, on the other hand, offers a good alternative for the budget conscious.